Some bits and pieces of things. Halloween 2008. Ian Garrett hangs lights over the stage for Song of Extinction. The Ford Theater sign, over the 101. Song of Extinction opens one week from today! Heading out to rehearsal soon. Found information today about a back-country wilderness residency in Oregon for writers. If I haven't entirely missed the deadline, I'd like to apply. It's two hours away from civilization along dirt roads... a cabin in the wilderness. Get away and write, like Thoreau. Doesn't that sound cool? My mother would freak out, but it sounds amazing to me. I think I'm getting oversaturated with city. Here's a line from the application: "You may mention a specific writing project you would like to undertake at Dutch Henry, but you're not required to do so. It is assumed that you will write. What you write is between you and the river." Oh, what a week it's been! We are finally in the theater. A set has been built. Lights have been hung. Props and costumes have been gathered. And all day Saturday and Sunday, actors took their places upon the stage, as we brought all the elements together. Everyone was amazingly patient with one another for tech days. Tech days are very long and tedious for everyone. It's the time when the light cues and sound cues and the actors' entrances and exits, and all the props and costumes are put together and written down by the Stage Manager. Jackie Moses (yay, Jackie!) is our stage manager, and she inhabited the booth with our light designer, Ian Garrett, and our sound designer, Jason Duplissea. Our set designer went back and forth between the house and the booth. Heidi Helen Davis (the director) and I and Kim Glann and Cece Tio were out in the house, watching and participating. And the actors were directed to mark their way through the play inch by inch. Where do they enter from? And do they enter from a light cue or a sound cue or a visual cue? When does that music kick in? Who is carrying that desk off stage? Where are my hand props? Who took Michael's shoe? Is that set piece going to work, or do we need something more/different? How loud should the chopping sound be? These are the kinds of things that the audience will hopefully never think about, because we have. We are trying to make the story-telling seamless. Natural. Right. I shall add more to this later, because it was a very full day. An actor was lost, then found. I went and ran a War Plays Project event, then came back for more tech. Butterflies were discussed thoroughly, and thrown from the rafters for test flights. I saw deer, hanging out right outside the Ford's fence. We all ate lunch together, and bonded. Everyone worked incredibly hard, and the hard work showed in the amazing things that were figured out. One play, starting to come together. I can't wait until Wednesday, when we go back and get to work on it some more! Talking about the play with the violist and recording technician the other night got me thinking about how you tell the story of your play to people. It's a tough thing. Flannery O'Connor once said that if she could tell you what her story was about, she wouldn't have needed to write it. And I totally get that. I certainly hope that the play will be bigger than any synopsis of it! But the world requires a playwright to say over and over again what their play is about, between the time when you start working on it (and maybe refuse to tell them) and when you finish it, when you start sending it out and when you get it produced. Song of Extinction is particularly difficult to synopsize. It's about a musically gifted, troubled boy who is dealing with his present, and a solitary, haunted man who is dealing with his past. It's about death in three different layers (cancer, extinction, genocide), without trying to conflate the issues. It's about music and it's about science. Fathers and sons. Teachers and students. Bolivian wetlands and Cambodian fields. I told the musicians that it's about how music stands in the face of death. Got up at 6am this morning and took an hour and a half long walk. My I-Pod is a handy exercise accessory, and I've noticed that Pod Casts are good for me to listen to in the morning -- get me perked up and awake. I only subscribe to free ones, and my favorites are offered by the BBC. I especially love "The Naked Scientists." It's a one-hour science show -- weekly, I think -- in which British people talk about funny, cool and important science stuff that's going on in the world today in a way that the average layperson/playwright can understand. As I get older, I've noticed that my reading tastes have changed dramatically. I used to read all fiction, and now I read almost all non-fiction. And everything becomes research for my plays... Writing Song of Extinction put me on a science kick that I'm still enjoying, and the Naked Scientists give a fun science "fix." There is a lot that needs to be done this week for Song and everything else, so today I am officially giving over to ORGANIZATION. To-do lists will be written and prioritized, e-mails will be returned, events will be organized. I may even do dishes. Look out world, here I come!! I'm sitting here on Sunday morning with both cat and laptop on my lap, and a cup of coffee beside me. It's been a busy week, getting back to real life after Ashland, and catching up with everything here in Los Angeles. On Wednesday, I attended a rehearsal for Song. I've missed a full week, and wanted to check back in and see how things were going, as well as give my director the new scene I wrote in Ashland. I saw lots of growth and depth in the actors, connecting with their characters and with each other. In less than a week, we have our first run-through in the theater itself -- [Inside] the Ford. I've moved into fluttery, nervous playwright mode a little. In the writing, one can feel sure-footed, at least some of the time. In control of the world you are creating. But to make your play into theater, you have to give over to a whole bunch of other people -- director and actors, producers, designers, composers (in this case) and musicians and finally an audience. You have to demand things, but you also have to trust people. You should check in regularly, but can't back-seat drive. It feels a little bit like throwing a baby bird out of the nest, hoping it will fly. I hope my play will fly. On Thursday, I had a great talk with Bennett Cohon. 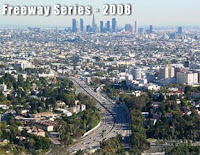 He's producing one of my short plays, called The Edge of Ross Island, over at Write Act Repertory Theater, here in Los Angeles, as part of an evening of short plays that he's calling "The Freeway Series." I'm delighted to have this chance to work with him! Bennett and I had been playing phone tag a little, but finally connected and ended up talking for half an hour about my little ten minute play. It was a great conversation, though. I felt like we were very much on the same page about who the four characters in the play are, and what they're trying to do. I'm going to try to see a rehearsal at the end of the month. Write Act is practically across the street from [Inside] the Ford, and both plays will be running at the same time. Funny how these things happen! Several writer pals have plays in the same evening, including Richard Martin Hirsch, Herman Poppe and Hindi Brooks. I'm looking forward to the show! On Friday, I was torn. 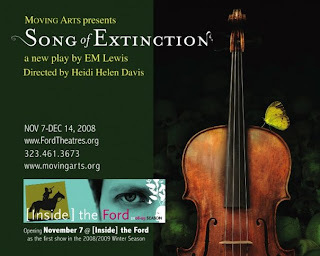 Heidi was doing an all-cast run-through of Song of Extinction, and I would have liked to have gone to that. But instead I walked over to the USC campus after work, to participate in the recording of the song of extinction. Geoffrey Pope, the composer I engaged so long ago now (2 and a half years? more?) to write a piece of music for the play had arranged a violist to learn and play the piece for us, and a sound guy to record it. Kim Glann (producer) and I attended, carrying notes from our sound designer, Jason Dupplissea. What fun! Renata Van Der Vyver was our violist -- a masters student in USC's Thornton School of Music, who is originally from South Africa. She was fabulously talented, and the sound guy, Barry Werger, was smart and knew not only what he was doing, but how to draw the best from the musician he was working with. The new version of the music -- which Geoff calls "Disembarking" -- is dynamic and strong and demanding and existential. I love it! It wasn't just a matter of recording the piece of music. If it was just that, Kim and I probably wouldn't have been needed at all. But the idea of Song of Extinction is that young Max Forrestal is composing this piece of music throughout the play -- bits and parts of it coming to him at different points. We needed Renata to give us those bits and parts too, and some pieces of Max practicing arpeggios and scales, and some of his frustration with how things are going in his life, that are coming out in his music. I told them the story of the play, and described it to them as music standing against death. They seemed to like that idea, and get what I meant. On an entirely different note, an odd little baseball play I wrote -- a short full-length -- called Catch has been pulling at my mind lately, telling me that it thinks it wants to be an odd little musical. I saw a performance of This Beautiful City by the Civilians that used music wonderfully, and am reading a book called Writing the Broadway Musical. Hopefully I'll find my way, and see what my play wants. So... From my last post, you might get the idea that these theater festivals are all about wandering around town, seeing theater, going in shops and meeting nice people. There certainly was a good bit of all that on my visit to the Ashland New Plays Festival last week, but my main reason for being there was to WORK ON MY PLAY with SMART, CAPABLE PEOPLE. I did a good bit of that, too. In the Ashland New Plays Festival, four playwrights were selected as winners, and all of us were required to attend the festival. We were given housing and a stipend to help allow us to do that, wherever we were coming from. Four directors were asked to read the eight finalist plays, and select which one they'd like to direct. The directors then selected actors from the Ashland area, both Oregon Shakespeare Festival actors and other local thespians, to be in our readings. Each of us had two readings of our plays, and at least one rehearsal with our director and actors. Each of us playwrights also led a writing workshop, on a topic of our choice. Christopher Acebo was my director, and I felt lucky to have him at the helm of my readings. He is the Associate Artistic Director of the Oregon Shakespeare Festival, and a top-notch designer. On Monday the 6th, I was able to meet Christopher for the first time, at the opening festival party. We'd exchanged e-mails, but it was great to actually sit down and talk about the play a little, and about my goals for our time working together. I was in a slightly different place in the process than a person usually is when at a festival -- leaving rehearsals for my production, and coming to work on the play some more. But I assured him that I wanted to take this opportunity to take one more really hard look at the script, and that changes in the script could still be put into the production, and happily so. I told him about a couple problem areas I was planning to look at particularly. On Tuesday afternoon, I attended our big rehearsal. The cast had already met once with Christopher before I arrived in Ashland, and did a table reading of the play, but this was my chance to meet everybody, and to give thoughts, feedback and suggestions about how they were doing the parts. (Those are given to the director, who then talks to the actors.) They could also ask me questions about things, if they wanted. What a wonderful cast Christopher had selected for me! I can't say enough about the actors. They were smart, bold and wonderful to watch. I felt like my "baby" was in good hands. Cristofer Jean (left, in a picture from his role in the OSF play "The Clay Cart") played the role of Khim Phan -- the biology teacher who is a survivor of the Cambodian genocide. Tasso Feldman (right) played the role of Max Forrestal -- the musically talented, but emotionally devastated high school student who Khim Phan reaches out to. Rounding out the cast were Brad Whitmore and Liisa Ivary as Ellery and Lilly Forrestal, Max's parents, Jeffrey King as Gill Morris, the evil land developer, and Neil Shah, as the young doctor, Joshua. What a great group! I definitely hope I have the chance to work with each and every one of them again someday. The rehearsal went great -- four hours of concentrated work on the script, and making the seating arrangements and the entrances and exits, and playing with the lights and sound -- all those details that make a reading look professional for the audience. There were talk-backs after each reading -- an opportunity for the audience to respond to what they just heard. For both readings, response was mostly fabulous and positive and excited, which is... you know... good. There were two guys in the audience for the first talk-back who doubted that the play could work without someone reading the stage directions. This is a fair question, I'd say -- the play glides from hospital rooms into Bolivian jungles, from real bus stops and classrooms to dream boats on magical rivers. It combines music and science, story and existential debate, and three levels of engagement with the question of death -- cancer, the extinction of a species, and genocide (without any intention of collapsing the issues). That's a lot! But I have a strong belief in the power of theater to do magic. It's not just about the words. Action and music and light and sound can do amazing things to transport us from one place to another. The play is in the process of being tested now -- that's the beauty of production, is you get the chance to see what works and what doesn't. But I believe in the magic. In all, the Ashland New Plays Festival was a wonderful experience. I loved spending time with my fellow playwrights, whose work I respected and whose company I enjoyed. I loved the AWE folks who put on the festival and hosted us, and the OSF folks who I got to work with on my reading. I appreciated enormously the fact that a bunch of my family members came to see my reading. 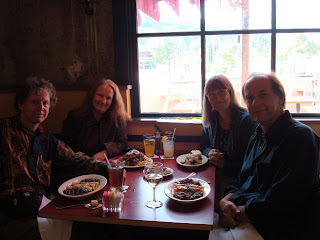 Mom and Dad and Jason, Uncle Harold and Aunt Lori, and Aunt Donna all made the journey to Ashland to see my reading. What a gift of a family I have! I love them dearly, and it was very special to share my most intimate self -- my writing -- with them. Scary, but awesome. I was really glad to have them there. Now -- back to work in Los Angeles on the production! ANPF - the rest of the story! 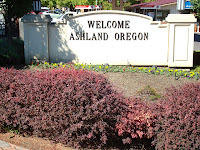 Back I am, from beautiful Ashland, Oregon, where I've been participating in the Ashland New Plays Festival. What an amazing time I've had! On Sunday, October 5th, I flew from Los Angeles into Medford to begin my adventure as one of the four playwrights selected as "winners" of this year's ANPF. Check out my last post for a review of day one -- which began with meeting and greeting the wonderful folks who made the ANPF happen (including Art Works Enterprises president John Lee) and culminated in attending a performance of "The Clay Cart" -- an Oregon Shakespeare Festival show that was designed by my ANPF director, Christopher Acebo. It was fabulous -- a 2,000 year old tale from India, well-told, with singing, dancing and lots of fun. I intended to keep up with this blog throughout the week... but I was having too much fun to have any time to write about it! Here are a few highlights from the week. Just walking through the town of Ashland made me feel better about life. It's a beautiful small town that is infused through and through with theater. And deer. Herds of wild, roaming deer and actors. Is that cool or what? The ANPF folks had given us coupons to a number of the local eateries -- a free sandwich here, a $5 gift certificate there. It was a great perk, and encouraged us to visit a variety of places during our stay. The town is full of fun shops, restaurants, bookstores and the Oregon Shakespeare Festival theaters -- the Elizabethan Stage, the Bowmer (where I saw "The Clay Cart," named after Angus Bowmer, festival founder) and the New Theater, where I was lucky enough to see "Coriolanus." I especially liked their local independent bookstore, called Bloomsbury Books. I contributed to the local economy by buying a photo book on Antarctica (research for a new play) and a book called "River of Doubt" -- an utter astounding find -- about Teddy Roosevelt's voyage down the Rio da Duvida, which I talk about in "Song of Extinction." It has pictures and everything! I am so geeky and delighted... I found out about his Amazon expedition when I visited the Natural History Museum in New York. 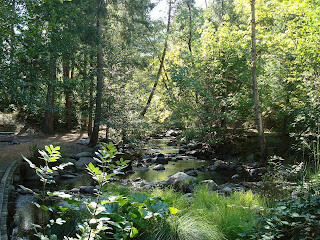 Lithia Park is yet another reason to love this town. The park (and its walking paths) run along Lithia Creek, and it is a very peaceful, beautiful place. I'll add more to this post later, because I haven't even gotten to the theater bits yet! But in the meantime, here's a picture of the four of us playwrights: Steve Lyons, me, Babs Lindsay and Tony Pasqualini. Do we look writerly to you? On Sunday morning at 8:55am, I flew north out of LAX, bound for Oregon and the Ashland New Plays Festival. My full-length play "Song of Extinction was selected as one of the four winners of the festival this year. I hadn't really slept the night before -- a combination of lots to do before I left, and being too excited about the trip to quiet my mind. Also, I really, really, really didn't want to miss my flight. I get to be in Oregon for a whole week, and don't want to miss a minute of it. Michael, one of the Art Works Enterprises folks, picked me and Los Angeles playwright/actor Tony Pasqualini up at Medford Airport. On our way to Ashland, he talked about how he and his wife love this area. He took us by John Lee's house; John is the president of AWE, and awfully nice. He and his partner, Steve, welcomed Tony and I to Ashland, and stocked us up with maps of the town, festival posters, ANPF t-shirts and gift bags that included gift certificates to half a dozen local eateries. It was great to meet John. Everything about the festival has seemed so well-organized and he's been great about communicating with us playwrights every step of the way. Michael then took Tony and I to the places we'll be staying this week. Each of us is being hosted by local theater patrons, many of whom seem to have extra rooms or apartments in their homes, probably for renting out during the high theater season when Ashland fills with Oregon Shakespeare Festival lovers from all over the world. We got Tony situated in his place, near Lithia Park. Then we headed over to meet Hollis and Mary Pat, my kind hosts. They've been going to, and then participating, in the Ashland New Plays Festival for fifteen years, almost since its inception. Michael carried my suitcases in, and Mary Pat welcomed me to the guest apartment in their lovely home -- within walking distance of the theaters, the park and everything. I unpacked and rested a little after that, but not for long. Hollis and Mary Pat had invited Tony and I and John and Steve to dinner, and Hollis had also arranged tickets for Tony and I to see "The Clay Cart" at OSF. It was a great evening, talking theater with a bunch of other people who love theater, then seeing a delightful show. "The Clay Cart" is a 2,000 year old Indian classic which (according to the OSF website) is "bursting with music and dance, color, action, and romance... Jewels are stolen. A Brahmin faces execution. A beautiful courtesan is at the mercy of the King’s bad-boy brother. Journey through a world where gamblers, holy men, political fugitives and royal scoundrels intersect and good people triumph." It was directed by the OSF's new artistic director, Bill Rausch, and designed by Christopher Acebo -- who is directing my reading of "Song of Extinction." I thought it was just delightful -- like sitting on the floor when I was little, being told a wonderful story -- but with lights and costumes and singing and dancing and tons of fun. After the play, Tony and I walked over to the little bar that all the actors go to after their shows to meet John and Steve. One of the actors who is going to be in my reading, Neil Shah, happened in and sat down to talk a while -- we'd just seen him in "The Clay Cart," and there we were having a drink together. By the time the fellows dropped me off back at my apartment, I was well and truly exhausted -- but very happy. What a wonderful beginning to the ANPF! Do I really get to be here all week long? I'm a very lucky playwright. 1. Write the play. It took me a good year and a half, minimum, to write Song of Extinction. The folks in Lee's workshop, which I've been taking on Saturday mornings, can attest to my hard work and inching along. It was a challenging 90 pages to write -- full of music and magic and ideas that occasionally felt like I was trying to push through peanut butter to figure out. The voice of Khim Phan, (the chain-smoking Cambodia-born biology teacher who narrates the play), was the only part that came easily. His monologues just flowed. The folks in my workshop were amazing help, keeping me honest all the way. So! Here's the history of Song of Extinction so far. 3. Re-write the play. Each of the readings above (all but Sundance involved a reading and/or workshopping process) allowed me the opportunity to work with a director and actors on my play. I got to hear my work out loud, listen to a director working on it with actors, get notes from the director, the actors and sometimes from the audience. From all that, I changed lines, deleted lines, added lines, reworked portions of the play, tried to make confusing bits less confusing. The playwright OWNS his or her play, so all revisions were things that I thought could be made better, found through the generosity of all parties. 4. Get the play produced. Hopefully, steps 1, 2 and 3 are leading to this step 4: PRODUCTION. It's easy to find yourself on a merry-go-round of sending out and getting readings. I think a year of this, after finishing a play, is helpful. Much more than that, and you're treading water (to mix my metaphors). I'm feeling very positive about the fact that Moving Arts is producing my play just a little over a year since I finished writing it. Okay... taking a half-step back, how did Song of Extinction get into the ANPF? Well, I finished the play, saw their submission opportunity on one of my playwrights lists, and sent it in -- and they began their assessment of my script and all the others they received. 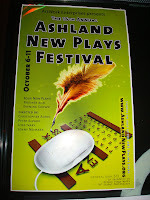 According to their website, the Ashland New Plays Festival has been running since 1992. It benefits, I'm sure, from the theater-friendly atmosphere of Ashland, home of the Oregon Shakespeare Festival for many decades now. The 2008 ANPF Readers Committee began its work in mid-February with scripts from 180 playwrights, (a 5% increase over 2007). The committee guarantees a minimum of three readings and evaluations per script, meaning that they will finish the selection process with more than 100,000 pages read during three rounds and more than than 1,000 feedback evaluations written. The second round of reading started in April and included about 50 of the original 180 scripts. These were evaluated by an additional eight readers. In the third round, about 15 remaining scripts were read by nearly 30 people, resulting in the final six selections. As a last step, a group of professional directors read and selected the four winners, which became the scripts for the October festival. The final four "winners" are Barbara Lindsay with A Death Defying Act (Seattle, WA), Tony Pasqualini with Loyalties (Los Angeles, CA), Steven Lyons with Mystery Spot (Berkely, CA) and EM Lewis with Song of Extinction (Santa Monica, CA). My reading is going to be directed by Christopher Acebo, who is the Associate Director of the Oregon Shakespeare Festival. My cast includes a bunch of folks from the OSF: Brad Whitmore, Liisa Ivary, Tasso Feldman, Cristofer Jean, Jeffrey King and Neil Shah. I'm looking forward to meeting them at our rehearsals, and to working with them. It looks like I'm going to be able to meet up for coffee with two "sister listers" from the International Center for Women Playwrights while I'm in Ashland. Organizations like this one have made the world a warmer place, travel more fun, and friends and fellow playwrights everywhere. From Sunday the 5th through Sunday the 12th, I'm going to be happily immersed in the world of playwriting in Ashland, Oregon. I couldn't be more pleased, and appreciate all the people who have made my trip possible.